I finished my DQS 13 quilt top last night. I hope my partner likes it because I REALLY like it and will hate having to part with it. Funny how that always seems to happen when I do a swap. I think I’m the type of person that needs to have a deadline in order to push myself. If it’s for myself, it never seems to get done. I’ve had this design drawn up for at least 2 years now and I never got around to making it for myself. 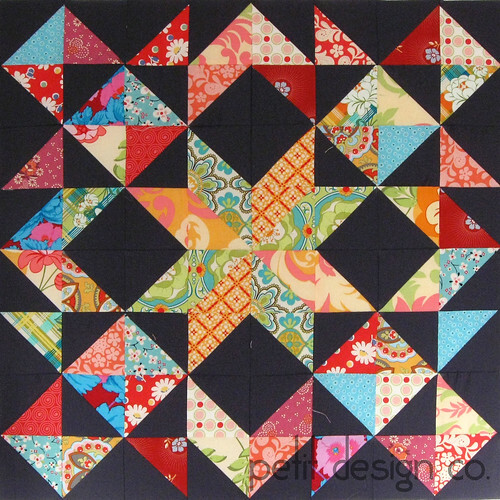 Did you make any sewing/quilting goals for this year? This is absolutely stunning! I'd love to have a pattern for this!! I love it. If your swap partner doesn't like it, I'll be happy to give it a home. That quilt is beautiful! Your points are spot on! I just found your blog. The series on using your walking foot for quilting, done in October is so inspiring. I'm going to try to quilt some of my quilts myself. Thank you very much.